Ethiopian Airlines, the Largest Aviation Group in Africa and SKYTRAX Certified Four Star Global Airline, has been awarded gold prize as the top performing cargo transportation airline at the Customers Annual Meeting organized by Guangzhou Bayiun International Airport on 30th January 2019. The award was handed to Ethiopian for being the first airline among top ten cargo operators to Guangzhou Bayiun International Airport. Ethiopian has the largest share, over 11%, of the total international cargo transportation at Baiyun International Airport in Guangzhou. Regarding the award, Group CEO of Ethiopian Airlines, Mr. Tewolde GebreMariam, remarked: “We are very honored that Guangzhou Airport has recognized us with this prestigious award. Ethiopian Cargo & Logistics, which operates 9 ultra-modern Boeing 777 Freigthers, each with 100 tons uplift capacity, is facilitating trade flow between Africa and the rest of the world, thereby contributing to the economic development of the continent. Ethiopian commands the lion’s share of the Pan-African passenger and cargo network operating the youngest and most modern fleet to more than 119 international passenger and cargo destinations across five continents. Ethiopian fleet includes ultra-modern and environmentally friendly aircraft such as Airbus A350, Boeing 787-8, Boeing 787-9, Boeing 777-300ER, Boeing 777-200LR, Boeing 777-200 Freighter, Bombardier Q-400 double cabin with an average fleet age of five years. In fact, Ethiopian is the first airline in Africa to own and operate these aircraft. 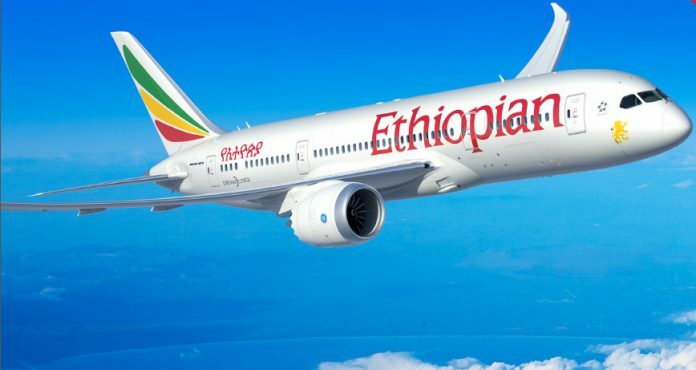 Ethiopian is currently implementing a 15-year strategic plan called Vision 2025 that will see it become the leading aviation group in Africa with Six business centers: Ethiopian International Services; Ethiopian Cargo & Logistics Services; Ethiopian MRO Services; Ethiopian Aviation Academy; Ethiopian ADD Hub Ground Services and Ethiopian Airports Services. Ethiopian is a multi-award winning airline registering an average growth of 25% in the past seven years.